For over 15 years, the California Oregon Advanced Transportation Systems (COATS) program has shown that a bi-state partnership to address rural ITS concerns is both feasible and advantageous. It allows for maximization of resources and provides a source for fresh ideas and perspectives. It provides a platform to address the issues and concerns of rural areas that might otherwise remain ignored. Numerous systems and approaches have been developed and evaluated over the years, providing useful information on which to base future deployment decisions. Several of these initial systems are still in place, addressing the concerns they were designed to. Finally, COATS has provided a platform on which to conduct expanding efforts geared toward outreach and tech transfer. The roots of the COATS program stretch back to 1991. Caltrans recognized that there were rural concerns in dealing with advanced technologies that would evolve into Intelligent Transportation Systems (ITS). In 1995, efforts were begun to specifically examine ITS technologies in a rural context through a scoping study. This scoping study, the Program for Advancing Rural Transportation Technologies (PARTT), reviewed advanced transportation technologies, identified key issues concerning them, and developed conceptual ideas for future activities. As part of this work, a geographic area in Northern California designated a study area to refine the need and application of ITS in a rural environment. Caltrans and the Oregon Department of Transportation (ODOT) expanded the Northern California study area into Southern Oregon to maximize resources, foster cooperation, and investigate feasibility of ITS in a bi-state study area. All of these activities laid the foundation for what COATS would become. In 1998, the Western Transportation Institute (WTI) at Montana State University, Bozeman, was selected to carry out further studies. Led by Chris Strong and Steve Albert, this effort, subsequently titled COATS, focused on ITS planning and architecture in the previously identified study area. Notably, the COATS project resulted in the development of the first two Rural Transportation Management Centers in California, one in Redding and one in Eureka. Additionally, the work resulted in deployment of an early-winner project. The specific activities of this phase of COATS, as well as subsequent phases, are outlined in the COATS project History. Check back soon for more California Oregon Advanced Transportation Systems (COATS) updates. 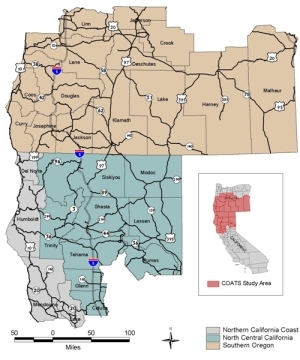 COATS Phase 7 is facilitating ongoing technology transfer through the Western States Forum and continued demonstration and evaluation of ITS technologies through several incubator projects. Here is a brief summary of what was accomplished during the fourth quarter of 2018. The 14th annual Western States Forum is scheduled for June 18th - 20th, 2019, in Yreka, California, at the Best Western Miner’s Inn. A Save the Date postcard was sent to announce this year’s event and catch the attention of potential attendees. The Call for Abstracts was released in December. The venue for the 2019 forum was reserved, and the Forum website was updated with the date of the 2019 Forum and the Call for Abstracts. During the first quarter of 2019, planning for the 14th annual Forum will continue. Abstracts will be selected, and first drafts of presentations and demonstrations will be reviewed. A brochure will be developed and registration will open in early March. Expect to see updates both here and on the Forum website as preparations continue. Check back next quarter for updates on the progress and status of the COATS projects.